Carter Loard Bays (born August 12, 1975) is an American television showrunner[clarification needed], writer and producer. He is best known as co-creator, writer, and executive producer of the CBS sitcom How I Met Your Mother. His show has been nominated for seven Primetime Emmy Awards, including Best Original Song for "Nothing Suits Me Like a Suit." Bays also co-founded the band The Solids, who perform the theme song to How I Met Your Mother, "Hey Beautiful". Bays was born in Cleveland, Ohio. His father, James C. Bays, is a retired corporate lawyer, and his mother is a minister in the United Church of Christ. While at Shaker Heights High School, Bays' play Five Visits From Mr. Whitcomb was selected for the Stephen Sondheim founded Young Playwrights Inc. 1993 Young Playwrights Festival produced at Playwrights Horizon's in New York City. Bays graduated from Wesleyan University in 1997. In the summer of 1996 Bays and Thomas were interns in the Development department of MTV. Bays became an intern at MTV in the Fall of 1996, which would later influence his writing. After graduating from Wesleyan in 1997, Bays and Craig Thomas became writing partners, writing for the Late Show With David Letterman. 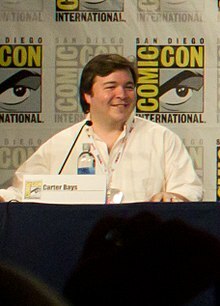 Bays also wrote for American Dad!, Quintuplets and Oliver Beene. Bays lives in New York City with his wife, Denise Cox Bays, and their three children, Pippa, Georgina, and Jack. One of his daughters appeared at the end of "Trilogy Time", another one at the end of "Unpause". Bays serves on the Board of Young Playwrights, Inc.
^ Chow, Greg (1 April 2014). "5 Essential 'How I Met Your Mother' Music Moments". RollingStone. Retrieved 22 March 2015. ^ Meiser, Rebecca (November 2008). "Mr. Write". Cleveland Magazine. Retrieved 22 March 2015. ^ Jordan, Jessica; Robles, Jiovani (17 September 2010). "How We Finally Met Carter Bays: Part 2". The Wesleyan Argus. Retrieved 22 March 2015.